We had such plans and hopes for the second semester of ninth grade, and although it hasn't been a total wash it also wasn't the experience we planned. Sickness, cat stress, anxiety, medication problems, overall exhaustion, and new insights from occupational therapy caused us some delays and forced some radical changes. 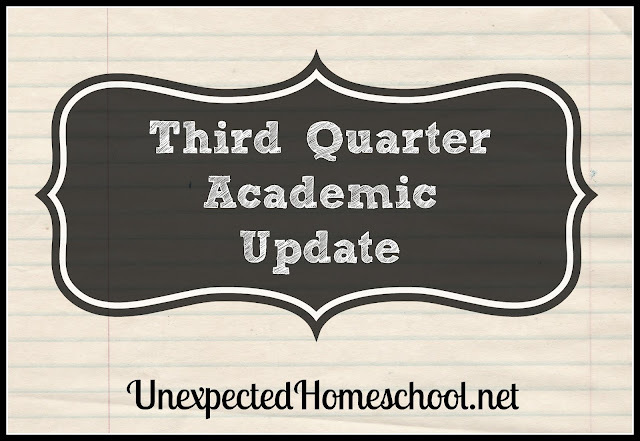 Amber is still on track to complete her required school hours by the end of the school year, but just barely. She may need to work a little bit into June if we have too many more slow weeks. Math - we decided in January that Amber is far enough ahead that we could take the semester away from math, so we did. It's been a huge relief for both of us. History - Tapestry of Grace was not working for Amber any longer. We found out that she is almost entirely a kinesthetic learner at this point and TOG was not what she found stimulating. We've adapted the remainder of the year plan and it has been more productive. However, we lost a lot of time spinning our wheels this year with a curriculum that wasn't working. Thankfully, Amber did a review item and some other work in a different history era that allowed her to earn history credit. The rest of this semester we will be working to get as far as possible in our adapted TOG plans. Next school year we will pick up where we leave off chronologically, but with a different curriculum. Science - Since I decided to teach Amber's forensic science class at our homeschool co-op, this class has been pretty easy to keep up with. Amber attends the once a week class where we have a lab, and then does the homework assigned like the rest of the students. It's gone well for us. I might have to teach science at co-op more often! English - Amber is pretty much current on this subject, although it is her favorite. She finished the last lesson of her IEW writing curriculum yesterday, and may start an IEW essay intensive the first week of April. Overall, this subject is exactly where we want it to be. Foreign Language - German is way behind where I thought Amber would be by this time. We did switch curriculum in December, but even so we have not made as much progress. It seems there is always something else to work on that feels more important. However, Amber is working on learning Greek as well through First Form Greek and she adores it. We could not have made a better choice in allowing Amber to work on two foreign languages at once. Electives - Amber takes drama, health, and religion classes at our co-op that have been a positive influence this year. She has kept up with her assignments in those classes despite illness or exhaustion. She has also been keeping up with her flute lessons, but not as well as the co-op classes since we needed to cancel several lessons due to illness and medical appointments. Our goal is to not miss a single flute lesson through the rest of the school year. Just this month Amber also started an online computer skills course that is allowing her to earn practical arts credits. She'd rather work on this course than history. I'm not sure what to think of that.